The Distinguished Artists Concert and Lecture series offered another cultural coup on Sunday with the presentation of Iranian-American pianist, Soheil Nasseri. Over the years, John Orlando and Distinguished Artists Concert and Lecture series has consistently been able to present artists of the highest caliber that one would only expect to hear in one of the major cultural capitols of the world, New York, Paris, London, Berlin or Milan and in an outstanding hall and on a superb instrument. While it was obvious from the beginning of the program that Mr. Nasseri was up to the highest standards set by the many outstanding pianists presented on the series over the years, this one was special with the Beethoven Hammerklavier Sonata Op 106 which up to that time was the longest sonata ever composed, running the full gauntlet of every human emotion possible within its 45 minute performance span, arguably the greatest sonata ever conceived. Did I say that it is one of the most difficult piano pieces both technically and interpretively? The first half of the program consisted of the West Coast premiere of Sonata No 2 by Hormoz Farhat. Unfortunately it posed a challenge for some who were not prepared to hear an unfamiliar contemporary work at the beginning of a program. This was followed by a rare performance of 3 Novellettes from Op 21 by Robert Schumann. Seldom played because, they pose a formidable technical and interpretive challenge that few performers are willing to risk. We were then given a fine performance of the Chopin Fantasy in F Minor Op 49. This piece shared the vague episodic story line similar to the Schumann pieces. No one seems to know who gave the premier performance of Beethoven’s monumental Hammerklavier Sonata Op 106. Evidently the true first performer of this enigmatic work and the one who in 1836 first “making comprehensible a work not yet comprehended” according the critique by the composer, Hector Berlioz, was none other than Liszt. There is a touching account of Liszt playing the famous adagio of this work spontaneously for a special gathering of nobility and high-minded musical connoisseurs in Wagner’s spacious living room-study-library. At its conclusion, the berobbed Wagner “thundering, rather than running” down from the balcony, flinging his arms around Liszt’s neck and sobbing with emotion thanking him for the wonderful gift received.”. 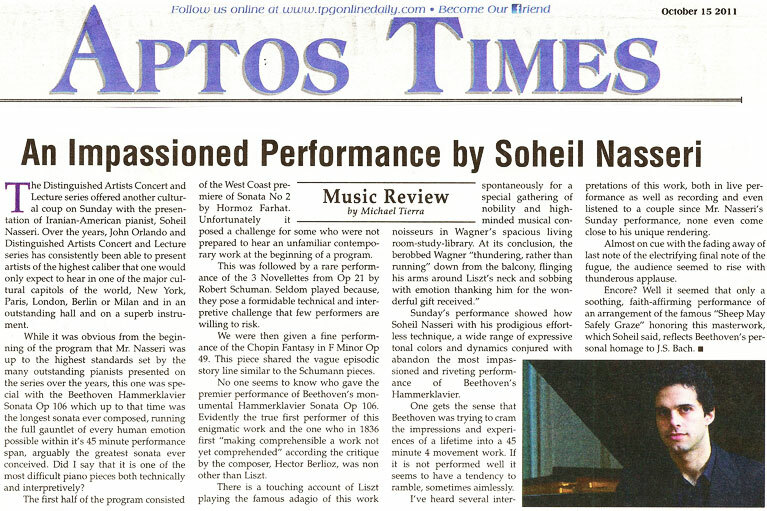 Sunday’s performance showed how Soheil Nasseri with his prodigious effortless technique, a wide range of expressive tonal colors and dynamics conjured with abandon the most impassioned and riveting performance of Beethoven’s Hammerklavier. One gets the sense that Beethoven was trying to cram the impressions and experiences of a lifetime into a 45 minute 4 movement work. If it is not performed well it seems to have a tendency to ramble, sometimes aimlessly. I’ve heard several interpretations of this work, both in live performance as well as recording and even listened to a couple since Mr. Nasseri’s Sunday performance, none even come close to his unique rendering. Almost on cue with the fading away of last note of the electrifying final note of the fugue, the audience seemed to rise with thunderous applause. Encore? Well it seemed that only a soothing, faith-affirming performance of an arrangement of the famous “Jesu, Joy of Man’s Desiring” honoring this masterwork, which Mr. Nasseri said, reflects Beethoven’s personal homage to J.S. Bach.